There are many examples of excellent three-flavor combinations. Bacon, eggs, and orange juice. Brown sugar, vanilla, and lemon. Pineapple, orange, and guava. Garlic, mushrooms, and butter. Larry, Moe, and Curly. Barbecue sauce, chicken, and red onion. It may be worth noting that none of these would make good Weird sodas. Whether this is due to some inherent mathematical incompatibility between Weird soda and the three-ness of such flavor combinations is unclear. Pairs of flavors seem to work well; Weird soda is inherently quadratic, rather than cubic? Those people with normal senses of aesthetics learn to pay attention to such laws. Indeed, a sense of aethetics might be argued to be inherently dependent on their observance--or carefully balanced violation. But the world of Weirdness must not be held back by such constraints. It must stride boldly forward, unhesitatingly violating such quaint concepts as balance, proportion, and good taste. And that brings us to tonight's review: Joia Lime, Hibiscus, and Clove soda. There are, as we have discussed before, multiple schools of Weirdness. When I can, I prefer to dip my toes in the sweet streams of fruit and cream sodas. However, a growing subsector seems to consist of sodas whose sole purpose in existence is to combine odd fruit, herbal, and other flavors* in novel and ill-advised combinations. Usually in threes. Color: Transparent, ever so slightly yellowish-greenish. The color of pale, sun-dried hay. Scent: Faint, cool, a bit of citrus, and a hint of floor cleaner. I'm not sure what that last is; volatile and spicy. Nazgul: "I know I've smelled it before." Given the state of the Lab floors, this is unlikely. Taste: Hmmm...mmm...blech. Let's see--the first taste is citrus, strong and a bit lemony. The hibiscus comes through clearly. However, what happens next is less than ideal. My mouth becomes slightly dry, and an odd taste spreads through it--a bit like alcohol, a bit spicy. Maybe a bit reminiscent of dry champagne. Not good. Kibbitzer in Chief: "Nice. It's clean, bright, and textured." I swear that this woman and I have a great deal in common. K-i-C: "It tastes like it should be alcoholic, though." Nazgul: "Very sour, but with a weird sweetness, too." So the Kibbitzer-in-Chief, whose aesthetic sense is generally considered a squillion times better than my own, likes this one. Let's consult Olorin; he also has a finely developed sense of balance, proportion, and beauty in all things. Olorin: "Mmmmm! That's really good!" Well, crud. Okay, I'm a buffoon. Quaff rating: I must be true to myself. 2.5. Cough rating: 1. The floor-cleaner part is icky. *The term is loosely defined here; it's only a matter of time before Weird sodas come in "coal", "breath-of-a-mermaid", and "esprit de corps" varieties. That's not "Wild Lime and Cucumber", by the way...it's two sodas, "Wild Lime" and "Cucumber". Although Wild Lime and Cucumber would probably be pretty good. Hello, all. We've been gone for some time. There are a variety of reasons, involving switching domain registrars, defending the Lab from alien attack, and the Great Soda Kablooie of 2013*. But we're back! I don't know how much longer the Lab will be in business, but for now we're still going. And a good thing too, because we recently found some new offerings from DRY soda company which simply must be quaffed, and without delay. Specifically, we'll be reviewing their Wild Lime flavor, followed by Cucumber. We've reviewed several DRY Soda flavors in the past, including Kumquat, Juniper Berry, Rhubarb, Vanilla Bean, Lemongrass, and Lavender. They've been intriguing, and sometimes good. Vanilla Bean and Kumquat both made our "Quaffiest" list. Interestingly, so did Mr. Q Cumber, which might indicate that tonight's flavor convergence will produce a mutant beverage of unspeakable savoriness. We'll start with Wild Lime. DRY tends to go for "just barely sweet", unusual flavors. Lime isn't particularly unusual, but "Wild Lime" is an unknown quantity. What, we wonder, makes it Wild? Will we be treated to "Fruits Gone Wild 3: Tropical Titillation"? *** Or is this the unknown character from Maurice Sendak's lesser-known sequel book "Where the Wild Things Are Making Pies"? Where and when: Purchased at Frazier Farms, Vista, CA, in April 2013. Color: Clear, no color at all. Well, Nazgul and Olorin both assure me it's faintly green, but they're nuts. Scent: Distinctly lime, not a lot of sweetness, but some. A little reminiscent of lime jelly candy, but less sweet. Taste: Wet. The company name is still misleading. 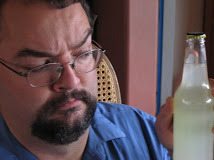 Olorin: "Kind of like Sprite, but less sweet. Maybe." Olorin is as decisive in his commentary as usual. It's kind of reminiscent of the unsweetened but citrus-oil-infused sparkling waters you can get. Just a bit sweeter than that. Pleasant. Olorin: "I like it. It tastes like kryptonite." Nazgul: "[It] doesn't really taste like much." I can imagine this being sipped leisurely on a shady porch on a hot day, but "wild" it is not. Quaff rating: 4. Pretty nice, actually. Cough rating: 0. Nothing offensive here. Okay, so that was...pretty good actually. I have high hopes for the Cucumber. Color: Also clear. No obvious color. Nazgul agrees in this case. Olorin: "It's practically completely opaque!" Nazgul: "Hey, look. I had one orange, and Granny gave me another orange. I have two oranges." Olorin: "No you don't. You have forty-eight pineapples." Olorin has actually invented--on the fly--alternative and clearly incorrect mathematical systems for the sole purpose of annoying Nazgul (and, not coincidentally, me) by claiming to have proven assertions like the one above. Scent:Hmm. That's really odd. I guess it does kind of smell like cucumber. Vegetal, a bit sweet. Kind of fascinating, actually. Ever so slightly peppery in the top of the nose. Nazgul: "I've never liked cucumber." Olorin: "It smells like platypus bladder." Olorin: "What? You don't know what platypus bladder smells like?" Taste:I have to hand it to DRY Soda--that actually tastes a lot like cucumber. Remarkably accurate--just the tiniest bit sweeter, but barely perceptibly so. Olorin: "It tastes like WOOOOOOOO cucumber! Kind of like with a cross with centipede Bertie Botts." Kibbitzer: "Tastes like cucumber, but not in that good farmer's-market-cucumber-agua-fresca way. You know how when you buy cucumber seeds, you can buy burpless cucumber seeds? That's not this." Honestly, I enjoyed the lime more, although this has to get points for accuracy. Whether that's a good thing, I don't know, but it's Weird, so yay! Quaff rating: 2.5. Drinking a liquidated carbonated cucumber is not entirely a good thing. Cough rating: 0.5. While it's not actually offensive, any vegetable-flavored soda has to get something here. ** This statement is a slight understatement. **** For those who don't know, and are thus preparing to report us to the authorities: a Dutch baby is a sort of popover, yummy with powdered sugar and citrus juice.